Getting employee attention when everyone’s so busy is a topic close to the heart of senior leaders everywhere. As such, we were invited by the International Association of Business Communicators to host a webinar on this topic recently, attracting a near-record audience. Watch the recording here to see how internal communicators can effectively reach out to employees on important matters such as culture, organizational change and during an emergency. Khyla Flores: Hello everyone and welcome, to today's session. This is Khyla Flores with IABC. 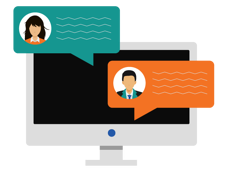 Welcome to today's webinar: How to get employee attention when everyone's so busy. I do apologise for any technical errors anyone had in joining the webinar today, Zoom was down for a bit, but now we're back up and running so thank you for your patience. During the presentation, all participants will be in a 'listen only mode', feel free to submit written questions at any time using the chat window located in the lower right side of your screen. We will go over all questions at the end of the webinar. Our speakers today are Philip Nunn and Rob Drasin, Philip is General Manger of SnapComms, a gloabl leader in internal communication software. In this role, he leads an international team of internal communication experts who specialize in helping major organizations meet the increasingly complex challenge of effective employee communication. Originally from the UK, and now based in New Zealand, Philip has a background inproduct innovation, business development and customer service, an ideal blend for understanding the multifaceted challenges of employee engagement today. Rob is president of Internal Communications agency Trident Communications LLC. Rob bring broad internal corporate and B2B experience to the panel. Innovation has been the hallmark of Rob's career, and he has cofounded several online and traditional communication companies. Rob is also active in the professional community serving two terms as the president of the New York chapter of the IABC and board member for the past 9 years. And now I'd like to turn it over to Phil and Rob. Phil: Thank you very much Khyla, Good morning everyone, and once again apologies for any technical difficulties that you may have encountered in joining this webinar. I said good morning, I'm based in Auckland, New Zealand, I would like to say sunny Auckland, New Zealand, but unfortunately its not particularly sunny this morning. Uh so It's just gone 8 o'clock in the morning here so I hope you don't mind that I've got my coffee in front of me here. 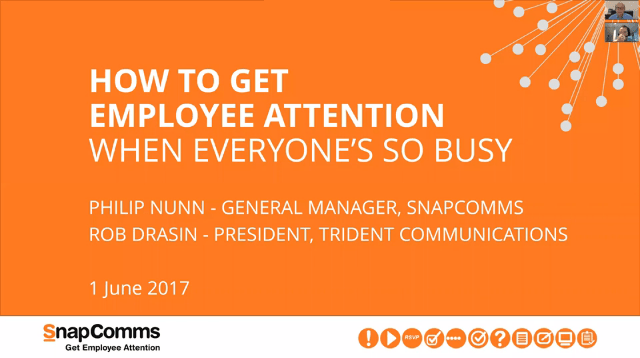 For those of you not familiar with SnapComms we’re in the business of Getting Employee Attention…we bypass email and push messages directly to employees in a variety of engaging ways. I’m based in Auckland, NZ, offices in NZ, US, London in the UK. Rob is President of Trident Communications and is based on the East Coast US, New Jersey. So what we want to look at today is, the workplace today, its both exciting and terrifying. Never before has there been so much information coming our way. Never before has there been so much pointless distraction. Which means Internal Communicators must carefully juggle how to get important information out to staff - without overloading or annoying them. In this one hour session, we’ll cover the trends and catalysts in IC, the cost of poor IC and we’ll take a look at three top communication challenges today, ensuring we get the right message, to the right people, at the right time. “Then” is just a generation ago. Employees were looking for stabile roles, with a company that they could stay at for a lifetime. They wanted a clearly defined career path and typically worked a 9-5 role. Now we find that today’s generation wants to understand a companies purpose, they want fulfilment from their role - What does their company stand for…what are it’s values and aspirations?. To attract real talent, an exciting company culture is now a major influence on how attractive a position is. Of course, technology has been a major catalyst for change - all you need now is a network connection. Employees can work from the coolest little café or from their comfort of home. Also, people have a greater ability of free movement – take me for example, I started in the UK and then moved to NZ. In fact, if you look over our office, we have only a few Kiwi’s…we have employees from India, Europe, the US, south America, etc, all of which bring their own unique culture to the office. Organization structures are much more fragmented than ever with a blend of remote workers in multiple time zones operating on all types of devices. It’s estimated that by 2020, just over two years away, ¾ of the US workforce will be mobile. Of course the issue of email (and information overload) is well understood…the average worker receives 122 emails per day (this seems a little light in my view!). The increased use of ‘consumer-led’ technology in the corporate workplace also brings challenges…take collaboration tools or social enterprise tools…- how do you harmonise this mix of moderated and collaborative channels? Do you even moderate at all or do you allow to run free? Fundamentally, the role of IC has been elevated in the workplace…we’re now often seen in an advisory capacity at the Board level. We’re much more pro-active as opposed to reactive…there is a whole plethora of Employee engagement products that offer to deliver solutions that improve staff engagement – whether they be mobile, PC based, etc. There’s an ever increasing amount of distraction…which can of course be driven by the ‘shiny new things’ themselves, however this results in a real problem in being able to understand prioritisation of communications…which channel do I respond to first? A good example is Workplace by Facebook …it’s a nice shiny new object but is it the right type of tool for the work environment…often these tools are introduced without any real evaluation and limited supervision. Lastly it goes without saying that staff expectations have changed…we talked earlier about the consumer universe being introduced to the corporate world. Our employees expect a rich media experience which very often is not necessarily the case with our internal comm’s that we currently produce. Finally however it has been widely proved and is now accepted that Effective communication improves engagement and financial performance. I guess this is something you’ve known all along, however the rest of the organisation is really only just waking up this this fact. Consequently more than ever before, the spotlight is on IC. Just looking a the number of high quality reports now available. These reports give you the ability to prove that an investment in IC gives a genuine business return. Whilst different surveys show different numbers, generally it is only a third of your workforce that is engaged…the remaining two/thirds are not. This means that this 60 odd % of your workforce are potentially not as productive as they could be. And it’s getting worse - the latest 2017 AON survey shows an actual 2% fall year on year for employee engagement. So, what are some of the key takeaways…the 2017 Workplace and Communications Technology Report, which was an analytical study of how time is used in the work place. They looked at time spent each day on different communication tasks and how they rateed the efficiency of each task, e.g. reading and replying to emails, on phone calls, text and IM, conference calls etc. they found that approximately $15K per employee, per year was wasted due to inefficient communications. This could clearly be improved by using the appropriate, most optimum communication medium. Approx 2/3 of the workforce are not as productive as they could be…we know that there is a proven direct linkage between financial impact and employee engagement and this is a huge area of opportunity for change. So, this is our Interactive poll…following on from the latest point on the previous slide…we’d like to understand if your organization has consciously changed the way it communicates in this New World. Employee media preferences have changed. As we’ve said all along…there is this pervasion of the Consumer universe into the corporate world. Employees have options to engage, or not with company communications. Executive communications can be easily validated and it’s no longer possible to ‘spin’ the employee. Consumer media preferences have simply become part of the corporate landscape and this is especially true amongst younger workers. We need to consider a new model…one that resonates with the preferences of our employees. Generally speaking attention spans are shorter and employees are sensitised to short bursts of information…bite sized video pieces as opposed to the five page handbook for example. Snackable content. Think of videos in a typical Facebook feed…how often do you watch past a minute or two? There needs to be a combination of in your face (disruptive messaging) as well as background (absorbed) information. Don’t forget we’re still catering for the multi-generations that exist within our workforce so a combination of what we consider ‘new’ style and ‘old’ style is required…digital and print for example. The key here is balance, variety, accessibility (short chunks) and repetition. When we look at the communication spectrum, from top down communications through to collaboration tools, from passive to intrusive, then depending on the nature of the communication task, there are a variety of tools that are clearly more appropriate than others. Whilst it’s on trend to be all collaborative, there’s still very much a need for top down communication…For example, an Emergency Notification requires immediate action, hence a Desktop Alert is considered optimum in this situation. This isn’t a collaboration tool, it is the organisation sending out messaging to its employees. Interestingly that certain tools perform well across the entire spectrum. Tickers for example (also known as a scrolling Newsfeed) can be very effective for reinforcing messages – behavioral change – but also for inciting action e.g. complete the staff survey now. Refers to any transformation or modification of human behavior. Or in other words, ALTERING PATTERNS OF ACCEPTED BEHAVIOR & INTRODUCING NEW. There are many reasons why you would need to communicate a behaviour change. Whistle-blowing, positive lifestyle habits, introduction of new operational or technological processes. A good recent (topical) example is the recent Wannacry Malware attack – this crippled public transport systems, hospitals, major organizations. In that case, staff are the first line of defence for cyber security - but how do you urge people to change passwords, diligently check links before they click, be aware of masquerading emails. People will change is they see the new behaviour as Easy, Rewarding and Normal. So what do we mean by that? Easy means the person being asked to behave differently believes “I have the skills and knowledge to do this, and there are no organizational obstacles to me doing this - I won't get in trouble, and nobody will get in my way." Too often, we ask people to behave in new ways that seem hard to them - either we haven't taught them the necessary skills, or they've experienced pushback from others in the past when they've tried to do them, and don't want to run into that again. Rewarding: For a behavior to be rewarding the person has to feel that, "Doing this behavior will give me results (emotionally or practically) that are valuable to me." This is where behavior connects to values; you have to show people how behaving in these new ways will support what they value. For example, if someone deeply values having positive human interactions, and you help them to see how behaving in a certain way toward customers will improve the interaction - they'll find that behavior rewarding. Normal: In order to change the way they behave, most people need to feel that "People like me act this way, and people I admire and want to emulate act this way." Human beings, for the most part, don't want to be the odd man out. Even folks who consider themselves renegades tend to emulate renegades they admire! If you want employees to behave differently, you have to be able to give them some evidence that their peers (at least the ones they like) and their role models are behaving in those ways. And it is paramount that Management needs to model the behavior itself. Let’s look at some strategies that effect Behavioural Change…It’s important to Inspire by Showing rather than Telling. For example, if constant criticism is a problem, encourage your managers to shut it down in meetings. Behavioral change starts at the top – role models. Provide training and Skills required – Be specific! Many change programs make the error of exhorting employees to behave differently without teaching them how to adapt general instructions to their individual situation. The company may urge them to be "customer-centric," for example, but if it paid little attention to customers in the past, they will have no idea how to interpret this principle or won’t know what a successful outcome would look like. Employees can’t learn merely by listening to instructions; they must also absorb the new information, use it experimentally, and integrate it with their existing knowledge. In practice, this means that you can’t teach everything there is to know about a subject in one session. Much better to break down the formal teaching into chunks, with time in between for the learners to reflect, experiment, and apply the new principles. Large-scale change happens only in steps. We’d also recommend supplementing the above activity with follow up quizzes to find any knowledge gaps. Quizzes are available freely (mention Survey Monkey, but explain limitations?). Aligning the ingrained practices and attitudes of employees to the values and strategic objectives of an organization. Whilst cultural shifts are a hard challenge, the catalysts that drive them are surprisingly common. For example a company merger or an acquisition. There’s a global movement to consolidate and speaking from a personal experience, I was at my last company for ten years and they were acquired three times. Each and every time brought about a significant change in culture…some obviously for the positive but some unfortunately for the negative. Either way, the change permeated through every layer of the company, every function, task, process, system, but more importantly the company outlook and it’s values and beliefs. Rob – I think you have an interesting story regarding a Pharmaceutical Group who successfully combined 6 very different cultures from different countries into one across 18 months . There’s also shifts in culture brought on by a change in focus…perhaps a new low-cost strategy or one centred around world-class Customer Service – these don’t just involve the front-line staff, it applies to everyone in the business for this to be truly effective. Interestingly, you may not be in control of your cultural shift (and therefore have little or no time to prepare for this). My last company was involved in Oil & Gas and one of our customer’s was BP. The change following the Deepwater Horizon disaster was quite palpable…we happened to have what was arguably the safest ‘widget’ in the market…not the cheapest but the safest. BP’s cultural shift towards a safety-first climate drove them to prefer our solution over the competition. Lastly look at the financial industry or the emission scandal by carmakers. All of these drive a fundamental shift in company culture. Technology facilitating a cultural shift to one of ‘collaboration’ – everyone has a voice. Employee-generated content has authenticity – essential at time when trust in senior leadership is at an all time low. But, lets’ not beat around the bush…changing culture is hard, frustrating, intangible and difficult to see the results. Taking our iceberg reference above - the bulk of a companies culture is the submerged part, comprising the “shared beliefs and assumptions” that are often ingrained and shaped over generations and generations. This drives company culture. What we can see above the water are the behaviours and outcomes that are the consequences of culture. Changing culture requires us to make changes at the beliefs level (under the water). This is by definition significantly more difficult that an operational process or information system change. If it’s so difficult then why bother? Yet, only 28% believed they understood their culture well with only 19% believing their organisation has the right culture. Clearly there is room for improvement here! The classical culture change model is three stages – Diagnose the existing beliefs and values that exist, reframe through role-modelling and the outward setting of new beliefs and behaviours through to the communication of these new values and behaviours. This does actually miss a very important step which is the Reinforcement of those new values and behaviours. It’s imperative to lead by example…be inclusive, all staff, group or one-on-one meetings. Ensure the ‘influencers’ in your business are involved and onboard. Create the right conditions for change…if a cultural change is to encourage more collaborative teamwork, change the physical office space to effect this. It’s often said that people leave Managers, not companies…managers are critical in effecting cultural change. They need to be able to absorb and retell the new values and beliefs that the organisation is trying to shift towards. They need to frame the culture in a way that resonates with their employees. It’s important for you all to “walk and talk” to understand and appreciate their perspectives. Clearly there is a huge potential for miscommunication if the management layer are not supported in their information cascading…don’t leave anything to chance…their vision needs to be the same vision as the core shift in culture. Lastly, measurement, measurement, measurement…understand how the shift is progressing…what’s working well, what isn’t? Unfortunate sign of the times, risk of shooter on site, threat of terrorism, even severe weather is greater than ever. It needs to be Multi – tiered…what happens if your primary form of communication is lost…what if the primary communicator is out that day? Channel-flooding – the ability to communicate with employees on multiple devices and methodologies…Desktop Alerts, Mobile, SMS, calling desk phones, digital signage…we need to ensure that everyone gets to know quickly about the emergency. Major utility provider, 6,000 strong workforce. Mid West of America. Remote workers must have up to date, accurate information. Many of them work in the field – think substation mechanics, meter readers, technicians and emergency responders. Previously, email had been the standard communication channel. But there were concerns that staff were overlooking / missing these important messages. The consequences of a belated or missed message are serious. Strategy was to find a solution that would go direct to employee’s device – and completely bypass email. For the message to stay on screen, or be repeated until the message was acknowledged be recipient. Often there’ll be an accident on the expressway. We can push information out and advise nearby staff to exit at the next off ramp. Consequently, we don’t suffer productivity loss and staff don’t have to sit frustrated in traffic for hours.